WELCOME TO DRIVETHRURPG'S SALES GUIDE! This week's discounts and deals on RPGs, Adventures, Maps, and more! Check out the latest offers from our publisher partners! This second collection of ten 1 on 1 Adventures is now available in one tome — powered by the Pathfinder Roleplaying Game! Knights & Legends is celebrating its first anniversary! The game strives to be that quality trpg at an affordable price. With an ever growing fanbase, this critically acclaimed tabletop game made a name for itself with the goal of providing a high/dark fantasy setting loaded with mythological beasts for you to slay. The campaign books and supplements add countless new lore content to further enhance its unique world. GODSEND Agenda D6 Rulebook: Based on a system used by over 300,000 rulebooks sold in a variety of genres, the new D6 System role-playing game offers fans of one of the most popular cinematic systems a new way to get their favorite game. Combining the best of over 15 years of D6 System design, GODSEND Agenda D6 rulebook provides an attribute and skill set tailored specifically to the super hero genre while using a game engine that's cross-genre compatible. As Spring Break closes, try one of our Hero Kids compatible adventures with your kids. 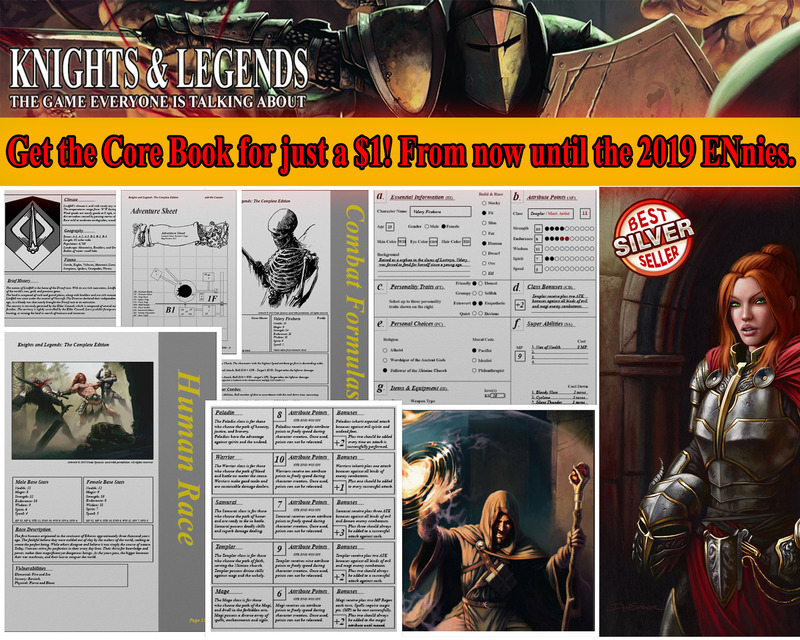 Get Dark Elves' Lair for the lowest price it will ever be at 25 cents! Get Unicorn Heist for $1.00! To celebrate the Deep7 Press 20th Anniversary, we're giving everyone 20% off our entire catalog at our DriveThru affiliates! Good for the entire month of April! Deep7 Press - Adventuring Boldly Since 1999. Many of the last year's solo, GM, and story writing titles are on sale for this week, 40% off. Don't just tell a story, make and experience your story through roleplaying! Flash RPG line and many character engines, generators, and tools are on sale. And as always, many bundles are available with titles at 30% off. To celebrate the release of its third content expansion, Making Science Fun, all Die Screaming titles are 66% off until May 3. UN-TAX SALE! — UN-TAX SALE! — Either you've got taxes to pay, or you're getting a refund... If you're paying out, make up for it by saving 50% on these Inner Ham titles! If you've got a refund, then you've got cash to put toward these Inner Ham titles! Win-win-win! It's not April Fools! All our products are 10% off for the month of April! Return to the court of King Cedfron, Baroness Azoulay, and the likes for more ventures into the shadowy beauty of Mystical 17th Century Spain. Seven all-new intrigues: adaptable to CLOAKED PAWNS and/or THE SCRYLLION CLOAK. Gear up for summer gaming. All GenIsys Fantasy 3rd Editoin products on sale now for 30% off. 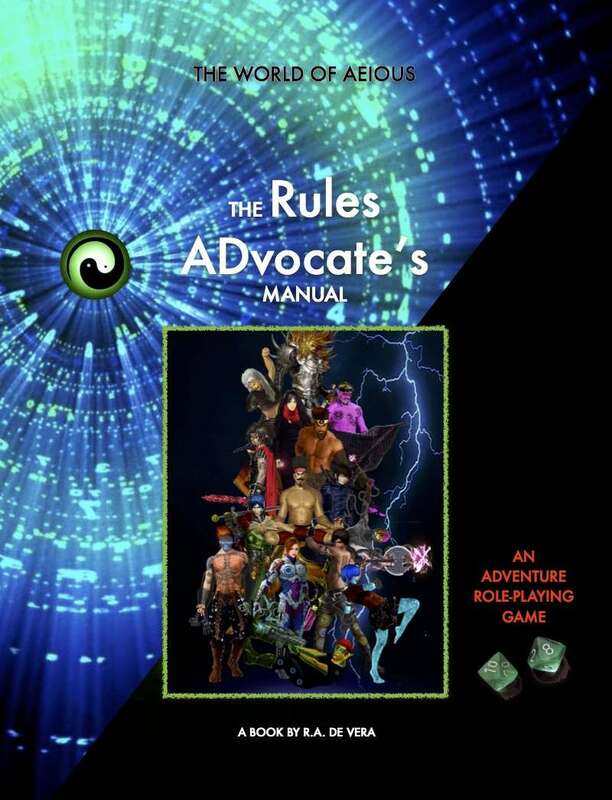 50% OFF on the Rules ADvocate's Manual. Learn the system rules today and run anime-like adventures in the wide, wild, Word of AEIOUS. The World of AEIOUS is a role-playing game inspired by the super actions of Dragonball Z and other stories that it influenced throughout the years. Half off all products for all the rest of April... a comprehensive "thank you" to the community that helped make DwD Studios an actual thing. THANK YOU!!!! All Map Packs Are 40% Off! 50% OFF thru April 24th! Volume 3 is coming out soon, so get caught up on past issues now! All week long, all my available content is 50% off!